Mini Projectors are awesome. Remember the old days when the teachers would wheel in the projector on a cart? The lights had to be turned off to see the projected image of whatever had been copied onto a transparent plastic sheet. Turning the lights off in the middle of the afternoon was not such a great idea if you wanted your fourth graders to stay awake and the same sleepy principle applies to a boardroom of executives right after lunch. Suffice it to say, some upgrades were desirable in the digital age! Now that a projector can hook up to your laptop and fit in your pocket, let’s see which one is the best on the market. This beautiful little projector pulls full size weight and is well worth its price tag. The IncrediSonic Vue Series PMJ-500 Pico Projector weighs only 1.5 pounds, so it won’t weigh you down in transit. Say goodbye to the 30 pound machines of yesteryear and the proprietary cables that don’t connect to anything but the wall. Super portability is the best thing about mini projectors, and the IncrediSonic fits easily into a laptop bag, briefcase, backpack, or purse. At only 8”x8”x4”, it is smaller than a piece of notebook paper. It’s probably smaller than your lunch! You get amazingly fast USB plug and play action with the View Series with Apple and Windows compatibility. Don’t worry if you forgot your MacBook – you can use a co-worker’s PC with ease. Access your files and share away with HDMI, VGA, Composite A/V, microSD (32GB Max) and/or a USB 2.0 reader. Yep, you can take your SD card right out of your smart phone and share a presentation you created on the train on your way to work. No one has to know – it will be our little technology secret. This projector is going to be your best friend in the office or at school for those incredible presentations, with very little set up time. We love that you can take it on a road trip to use in your hotel room, have amazing video projection in an apartment or dorm where you can’t exactly wire a mounted projector, or have a neighborhood movie night in your driveway or back yard. Use the IncrediSonic at a family reunion for a slide show you’ve put together, or just have it set up so everyone can share their own pictures right from their smartphones. Just hook up your laptop, DVD player, or BluRay player and bring on the popcorn. Connect your Apple or Android tablet, gaming console, or cable box. This little projector is so versatile, you can use it with almost anything. The added convenience of a screw port on the bottom of the PMJ-500 means you can set this projector on a regular camera tripod for instant setup anywhere. Want to literally take your presentation to the next dimension? Go ahead. The IncrediSonic has industry-leading 3D HD ready technology, and brilliant 2D to 3D conversion. You don’t have to be a graphics design genius to figure this out – the program is easy to use and impressive to see. You can watch 3D content and even turn 2D images into 3D. In fact, you can project up to a 115 inch image, but you’ll have to go old school and turn off the lights for clarity that large. Yeah, sure honey, I’m working on my presentation! (We won’t tell you’ve figured out how to project the big game onto the wall of your office with your cell phone and the sports channel app, okay?) Keystone image technology ensures a perfectly flat image with no distortion from the angle of the projector with automatic adjusting for the best picture possible. Control the projector from the unit itself, or have the freedom to walk around while presenting with the handy remote control. For small rooms, the PMJ-500 gets by with a built in speaker. In fact, the only drawback we noticed about this projector is the lack of great audio. You can work around this by plugging in larger speakers into the integrated jack to produce more sound for a large room or for outside, or use headphones for gaming. It’s all about the lumens when it comes to projectors, and the Vue Series has them – 500 of them, to be exact. 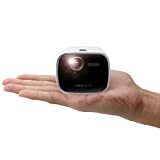 500 lumens makes the IncrediSonic the lightest and brightest of all of the mini projectors we checked out. How do they pack so much light into this tiny projector? The PMJ-500 has a special optical engine to produce high definition resolution images at at a native resolution of 1280x800p – no scaling! You’ll get vibrant color technology from the Texas Instruments DLP technology for over 20,000 hours – that’s about 2 ½ years of continuous use. Instead of conventional light bulbs that produce a lot of heat and cost you a bunch of money in replacement costs as they tend to burn out fast, IncrediSonic went with a revolutionary LED light system to save money and resources – in fact, the LED system lasts ten times longer than conventional bulbs. That’s cash right back into your pocket. The IncrediSonic Vue Series PMJ-500 packs everything you would expect in a larger projector into a device the size of a hardback book. At around $500.00, you really do get what you pay for – excellent, clear image projection, awesome compatibility, long-lasting light source, 3D projection, and convenient portability. We recommend picking up a travel case to protect your investment, though, as it does not come with the unit. The AAXA LED Pico Projector is truly a pocket projector. At a mere 4.25”x 2.36” and under an inch thick, this portable Pico projector is smaller than a woman’s wallet (about the size of two iPhones stacked up), and weighs just over half a pound (9.6 ounces). You really can just stick this in your pocket and go for ultimate portability. The AAXA has a built-in rechargeable battery that will run for an hour and 20 minutes, so you don’t even need a power cord when you waltz in to the office for your super cool presentation. With an ultra bright 25 lumen bulb, you’ll get high definition resolution (qHD 960×540) and Vibrant Color Technology from the LCoS (Liquid Crystal on Silicone) display. The energy saving LED bulb will last up to 15,000 hours (about two years). What does all of that men to you? Well, you’ll get a super sharp, beautiful image projection up to 60 inches in a darkened room, and you won’t have to replace expensive bulbs all of the time. Not bad for a projector that fits in your pocket! The built in speakers of the AAXA LED along with ports for mini-HDMI, composite A/V, Micro SD, and USB make this projector perfect for sharing pictures and videos with friends, or giving your savvy sales pitch during a lunch meeting. The unit does support auxiliary speakers with an audio jack if you need more sound. With USB Plug n Play instant setup, you can run a presentation or share media from your Mac or PC quickly, or pop the SD card out of your camera or smart phone and share away. Photographers might find this unit especially useful for instant sharing with clients, and kids will love it for sleepovers. 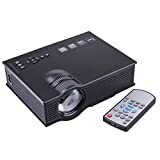 Though this handy pocket projector isn’t the best for showing drive-in style movies in the back yard, it is great in your living room or hotel room. It lacks Keystone technology to create an automatic adjustment, so you may need to make some manual adjustments for the best picture. The short battery life (80 minutes) means you’ll have to keep the projector plugged in while watching a movie, but we don’t see that as a problem since you’re not likely to be moving around during viewing, and the fact it can be battery operated is such a bonus for any amount of time. It is perfect for media sharing and presentations with the included tripod, and doesn’t require much setup space at all. You know how difficult it is to huddle around a cell phone when you want to share a great YouTube video? Just pull out your AAXA projector and enjoy the elbow room. A darkened room will give you the best picture from this projector. The AAXA LED Pico Projector will leave you pleasantly surprised at all of the features and quality it packs in, with a price tag of around $115.00. It makes a great addition to your briefcase or laptop case, and a wonderful gift for teens, technology lovers, and even grandparents who love to share pictures of their grandchildren. 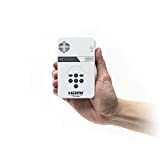 If you are looking for a small portable projector for simple file sharing or personal use, this is the perfect projector for you. 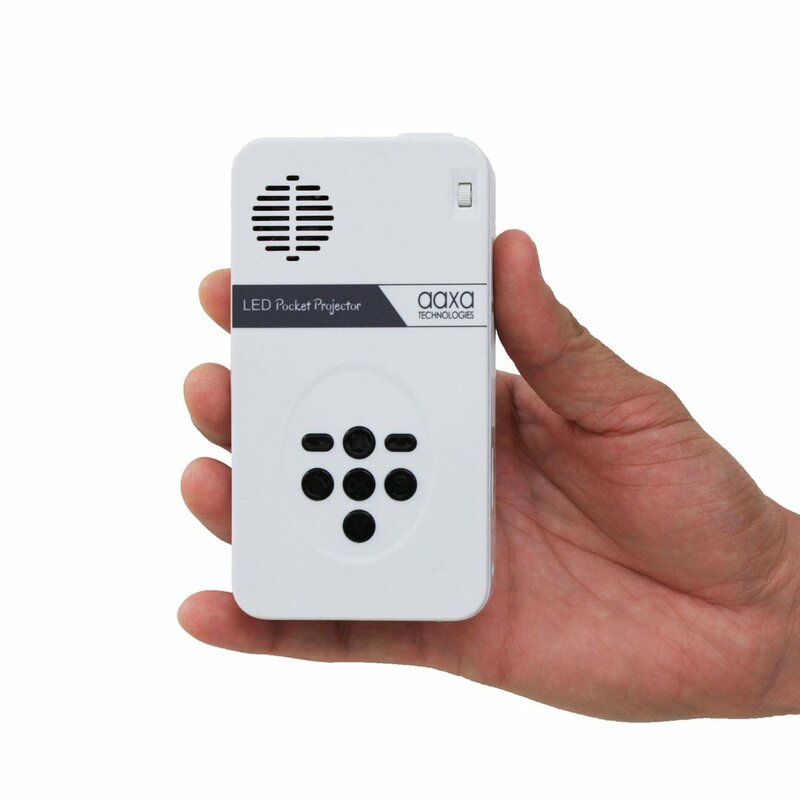 If your main goal for a mini projector is watching movies and videos, the iCODIS CB-100 Pico Projector is for you. This little 4×4” cube weighs only 1.4 pounds and was designed to mimic the styling of a vintage television set. Don’t be fooled, though – there is absolutely nothing vintage about this projector. The iCODIS runs on an integrated Android 4.4 operating system, which means you can download your favorite apps right to the projector and enjoy streaming movies or videos without hooking up to a laptop or tablet. You can operate the system with a wireless mouse (not included – you’ll need to purchase one as there is no remote and the little dial is tricky to use), and the projector comes with a flexible tripod. The features include wireless screen mirroring for giving presentations (especially tutorials) or for those times you’re enjoying a video on your tablet and a friend comes in to watch with you. 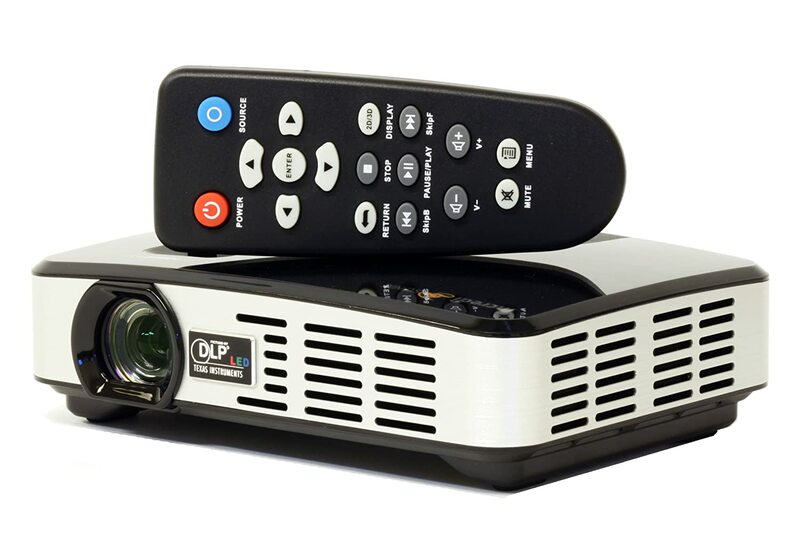 The DLP technology offers advanced multi color processing for super sharp images and true colors with widescreen style projection, so the image is as clear from the sides as from the center. The energy efficient LED bulb with 45 lumens has about 20,000 hours of life to it, but cannot be replaced, so once it’s gone you’ll need a new projector. With as much technology as is packed into the CB-100, you would likely need an OS upgrade after a couple of years anyway, so this isn’t necessarily a negative, but something to note going in to the purchase. The CB-100 is WiFi and Bluetooth compatible. It does not receive input from wired devices, but it does take SD cards for image sharing. This little gem makes it almost too easy to stream videos and movies, and it has a 90 minute battery life with backup ac/dc cord so you can run it plugged in for as long as you want to watch. The integrated fan has been designed to keep the system cool while running continuously, so go ahead and have that Netflix series marathon. Invite some friends and order a pizza; they are going to be impressed with your purchase! A manual focus is built into the iCODUS so you can get a perfectly clear picture up to about 50 inches, and the image remains clear from very close to a wall to a good distance away. With a protective silicone bumper, you don’t have to worry about kids dropping it, so go ahead and use it for sleepovers or parties. This projector works best in a pretty dark room, though some users have reported a decent picture in a light room as long as there is no direct sunlight or lights shining on the wall. The CB-100 has good sound quality from the built in speakers when using in an otherwise quiet room, but they are not the loudest. If you need more volume, there is a port for external speakers, or of course you can connect a wireless speaker system. 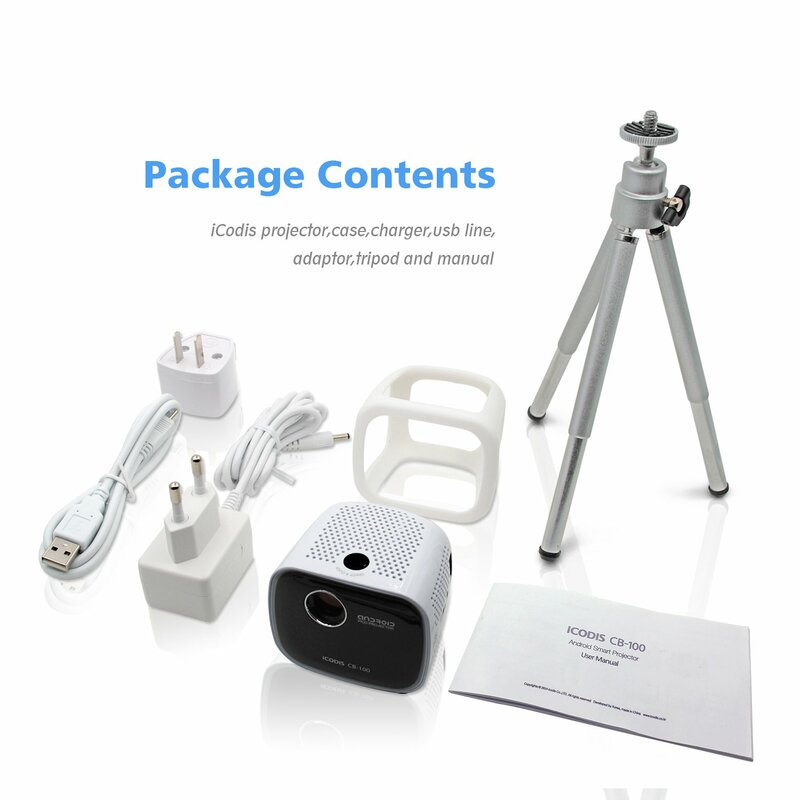 All in all, the iCODUS CB-100 Pico Projector is impressive with its size and styling, and integrated Android operating system. You really can’t beat the price of about $220.00 for a device that is so attractive and so easy to use – just turn it on, download your favorite movie apps, and enjoy your evening. If you need portability with a tiny price tag without lacking great projection, the UC40+ HD Mini Pico Projector is your guy. It isn’t exactly tiny at 7.9 x 2.7 x 5.9 inches and weighing in at 2.2 pounds, but it is definitely small enough to tote around with you wherever you need it. The best thing about the UC40+ in this class is that, with an 800 lumen light source, it still gives a pretty good projected image in a lighter room, making it perfect for office presentations. Goodbye, sleepy executives! With a native image resolution of 800×480 (supporting up to 1080p input), you get a sharp, clear picture up to 130 inches from up to about 12 feet away. Turn off those lights and you’ll have an image that rivals theatre viewing. There is no projector or stand for the UC40+, so keep that in mind when purchasing. You’ll need to have an appropriate table or just use a stack of books to project from. You could use a cradle mount from your ceiling if you want a more permanent installation – the projection is so good that you just might want to use it all of the time. The UC40+ HD Mini is perfect for transfer applications, such as in home decorating. Have you ever wanted to paint a mural on a wall in your home? It’s easy to project an image onto the wall, trace it, and paint away. This projector is perfect for fun jobs like this, and at the perfect price. Playback is easy with the UC40+ with A/V connections and HDMI, SD card, and USB ports. The projector has integrated 2 watt speakers on each side, and a port for plugging in external speakers if you need more sound – perfect for movie watching. The battery operated remote control makes it easy to operate, and the manual focus allows you to fine tune your projected image. This system is great for video gaming – just plug your system into the AV ports and have an all-night game party with your friends. With the ability to create a huge image right on your wall, you just might feel like you are inside of the game. The UC40+ is a great little projector for its price and has great features that are perfect for office, home, and outdoor use. Portability, great picture, and reliable function for under $100.00? We’ll take it, and we think you should, too. There really isn’t a point in purchasing a projector with bad resolution. Comparing specs is great, but real life application can make a difference in your results. You need to know the native resolution (at which resolution is the image being projected) – not only the input resolution. It’s great that you can take a 1080p resolution file and project it without distortion, but it’s not going to be 1080p on your wall. So keep that in mind as you compare, and purchase a projector with the best image resolution possible, even if it doesn’t have all of those attractive bells and whistles. The lumen measurement will decide how dark the room needs to be for a good image projection. If you are using your projector in a light room, say a conference room with semi-transparent blinds or shades, you’re going to need more lumens to project a stronger image. If you plan to watch movies or play video games in your windowless basement with all of the lights off, you can go with fewer lumens in your light source. Do you need to toss your projector in your purse or briefcase for frequent use or travel? You should consider the space you have to carry it, and the space you have wherever you’re going to use it. The tiniest projector will fit in your pocket – great for real estate agents, photographers, and kids. The larger mini-projectors might need their own carry case, and you’ll need a decent space for setting it up. Consider the environment in which you’ll use it. Will you have access to an electrical outlet close by? Or do you need a battery powered unit for quick and easy setup? We list price as the last consideration because you get what you pay for and sometimes you need to pay for what you need. If you just want a fun little projector for the kids or for sharing photos at a party, you don’t need to spend a lot of money. If you’re planning to use it every day for business, training, or heavy video game use, you will probably want to consider how much projector you can afford, and get the one that has the best of the feature you need – namely high resolution and a bright bulb with high lumen output. After all, it’s frustrating to spend money and not really have what you need. A mini projector can truly change the way you do business, share media with friends and family, enjoy family time, and get your game on. There are many on the market, but there are enough variations and knock-offs that it is important to do your homework. Definitely don’t judge a book by its cover and choose a projector just because it looks good. Look at the specs and read about the features. If you are used to streaming video on your tablet or smart phone, you’re going to love having a projector that makes it easy and fun. If you’re looking for a gift for grandpa, though, you only need a very basic projector with a few user-friendly features. The product has to meet your needs, big or small.